Search for books with a corresponding Renaissance Accelerated Reader 360® quiz, ATOS book level, Lexile™ measure, interest level, title, author, fiction/nonfiction, subject, award-winners, state lists, CCSS Exemplars, and more. An online literacy resource that pairs classic video storybooks from Weston Woods with related non-fiction eBooks from Scholastic to build a love of reading and learning. 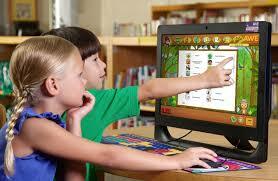 BookFlix reinforces early reading skills and introduces children to a world of knowledge and exploration. Not at the Library? Access BookFLIX at home by logging in with your library card number. An online collection of TumbleBooks – animated, talking picture books which teach kids the joy of reading in a format they'll love. TumbleBooks are created by adding animation, sound, music, and narration to existing picture books in order to produce an electronic picture book which you can read, or have read to you. There are two bilingual AWE Early Literacy Stations available in the Children's Room. These stations have literacy games, a child-friendly internet browser, and all content is available in both English and Spanish! You do not need a Library card to use these stations, but sessions are limited to 30 minutes at a time.